Here is my first vintage cast iron! 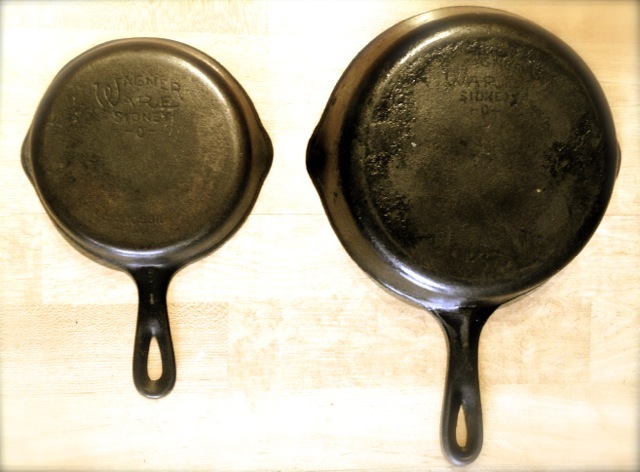 I have heard about how great the vintage Wagner cast iron (or WagnerWare cast iron) is versus the new modern varieties that you might find these days. 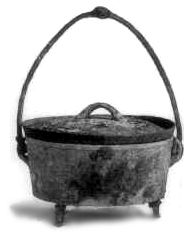 Today, Lodge dominates they market and I have plenty of Lodge cast iron cookware (skillets, griddles, and dutch ovens). You can also find some cheaper brands, probably made in China, and most likely inferior to the Lodge. These Wagner cast iron skillets were actually in pretty darn good shape overall. The quality was apparent even it if was partly psychological. Either way, I could immediately see how smooth the interior surface of the skillets were. I was seeking out good deals for some Wagner skillets on eBay. The thing is some of the very clean pieces that have been stripped, de-rusted, and re-seasoned can fetch a pretty penny. We’re talking $20 or $30 up to over $100. Surely some of these items are over priced to some extent, maybe some of the pieces are just really rare and hard to find, or maybe some bidders let their emotions take over and the final, winning bid was higher than they intended. It isn’t like there is manufacturers suggested retail price for this stuff. Anyhow, I focused my search on some of the lower priced items initially. Once I narrowed it down a bit, I looked for items with some apparent and visible defects. My reasoning was that it would be easy in most cases to fix any of those defects. 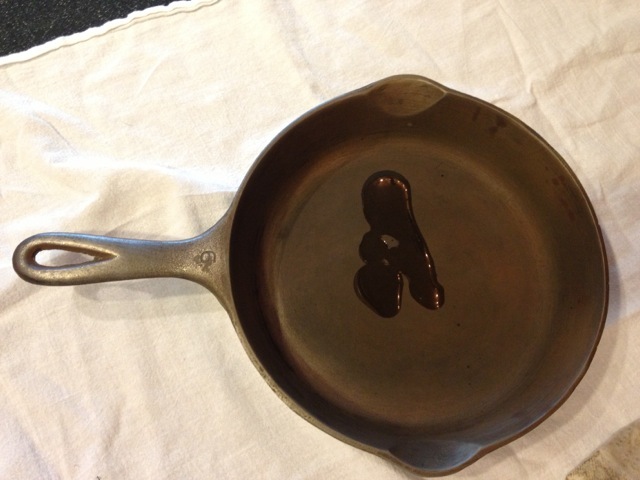 If a skillet is rusty, then you can clean it well, use some vinegar at a 50% dilution with tap water and soak it for a little while. Maybe use a little steel wool to get the last bit off. If a skillet is a little crusty or even a lot crusty with old greasy seasoning, you can still deal with that. You’d be able to use some restoration methods and end up with a pretty good result. Ask questions! You can just be direct and ask about the condition: Is there any rust on the item? Is there any pitting? Are there chips, especially around the edges? Is the bottom completely flat and absent of wobbling? Are there any defects? You only want to purchase from a reputable seller and a reputable seller will answer your questions promptly and honestly. I actually bought a pretty beat up Wagner 1058 that was a little rusty on the inside and had 1/8″ of visible gunk and seasoning in some areas. I cleaned it up using some oven cleaner and patience. It looked pretty beautiful once it was cleaned up but a crack was also revealed. 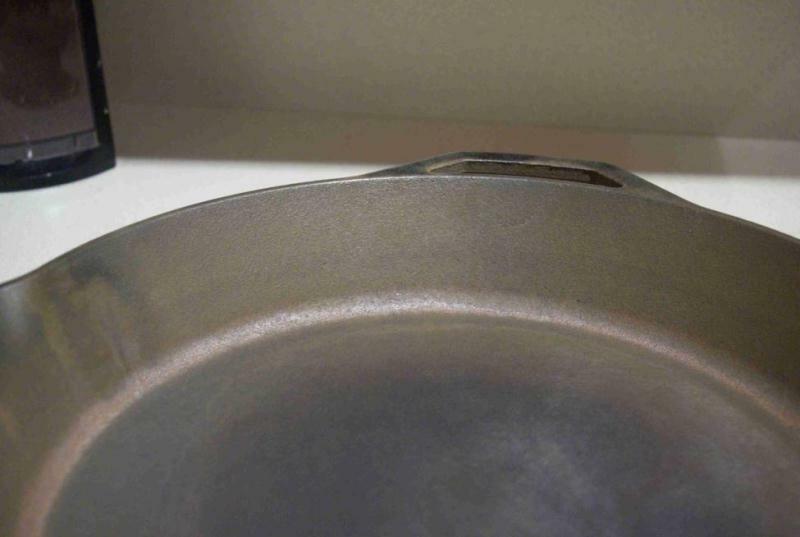 It’s not a huge deal since it actually doesn’t seem to affect the cooking at all even though you can see the crack on the interior and the bottom of the skillet. That’s a long way of saying that, 1) a crack isn’t necessarily a big deal, and 2) defects may not be apparent if the cast iron cookware has a thick layer of seasoning. Flat bottom usually means no heat ring rather than non warped. 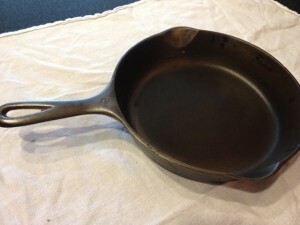 Check out a few of the auctions that do have cookware with a heat ring and you will see what I mean. Cast iron can become warped if it was heated or cooled too quickly and the result is a permanent disfiguring of the metal. It is most critical if you are cooking on a flat glass top and if the warping is severe, you may not be able to use the cookware effectively on the stovetop but the oven or grill would still be fair game. If you are using a gas range, or electric coils, the impact of a warped piece is far less important. To reference the Wagner 1058 again, this skillet was flat on the bottom with no wobbling initially. Well, after all of the cleaning it turned out to be a little wobbly. I do have a flat, glass top stove top range so this isn’t ideal. However, the skillet is still usable and seems avoid having a hot spot based on the point of the skillet that is actually touching the stove. I do need to do some more research on that though. Beware of reproductions. Here is another gotcha that you can ask about and while the seller may not admit it directly, you will have made it clear that you know what you’re talking about! Look out for the “Wagner’s 1891 Original” which was manufactured from 1991 to 1999. 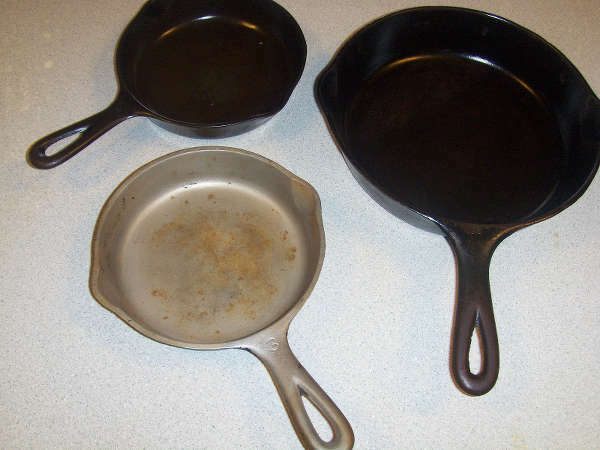 You can find these often; you’ll know they aren’t vintage because of the engraving on the bottom dated “1891” and the fact that they are completely underprices for some cast iron that is over 100 years old. How Much Does Vintage Cast Iron Cost? In this case, I won the auction for $12.05! A great bargin if you ask me! “How much was the shipping? !” you say. The shipping for the lot of 3 skillets was $15.85. Yep, the shipping cost more than the goods. Each of the skillets was less then $10 a piece, they can pretty much last for a few lifetimes if you take care of them right. I felt great about this deal overall. This may be an exception as far as the pricing but I think if you lurk around and take your time while monitoring the auctions, you too can find a good deal. As I mentioned, you can find a full range of pricing, from reasonable to outrageous. Well, I wasn’t too enthusiastic about the unnamed #3 but it turned out to be wicked smooth and in excellent shape. The seasoning on this one was first rate! The 1053H was pretty much pristine – It looks like it was in the original box for 50 years and got a little damp. I am certain that it was never used and after a little vinegar bath for about 30 minutes, plus a little baking with canola oil (how to season), this 1053H was better than it was new. The 1056N looked great with a very solid looking seasoning. I took it for a test run with an egg and it performed flawlessly – no sticking at all! I am really happy with my purchases and look forward to finding more great deals on eBay. Wonder why you can use a #3 or 1053 cast iron skillet for? Check out this recipe for calzones cooked on the grill. For some additional information, I encourage you to check out The Cast Iron Collector site. It has a huge amount of valuable information and a very nice community and forum. important piece of equipment they carried was a cast iron Dutch oven. fuel when he was in a serious hunting situation. bunch of Dutch oven cook-offs popping up all over the country. energy than most of the other cookware on the market. savory seasoning “flavor” that no other cookware can duplicate. more folks ain’t using it? First, inspect your black iron casting for a smooth interior surface. fresh coating is applied each time the pot goes into the oven. take on a deep, shiny black finish. it clean and used it frequently to keep it in top condition. has ever worked as well for me as the old Cherokee recipe. sizzles up some of the finest grub in the land. Seasoning cast iron is a process and it is literally the foundation on which you cook your food. It is critically important to prolong the longevity of your cookware and protects it fromt the elements, namely moisture. If you ask 5 cast iron enthusiasts how to season cast iron, then you will probably get six answers. And, if you ask the right person, he or she may have six answers all on their own! Most likely, each answer is partially correct and will get you a pretty darn good foundation to cook on. Pre-heat your oven to 250F. 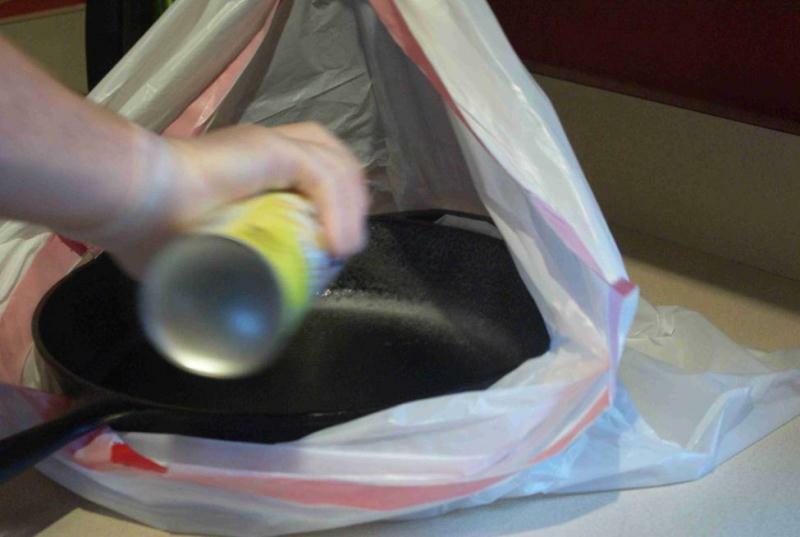 Wash your cast iron cookware in hot water with soap and a stiff brush. Dry completely with paper towels then place in your oven for 20 minutes. 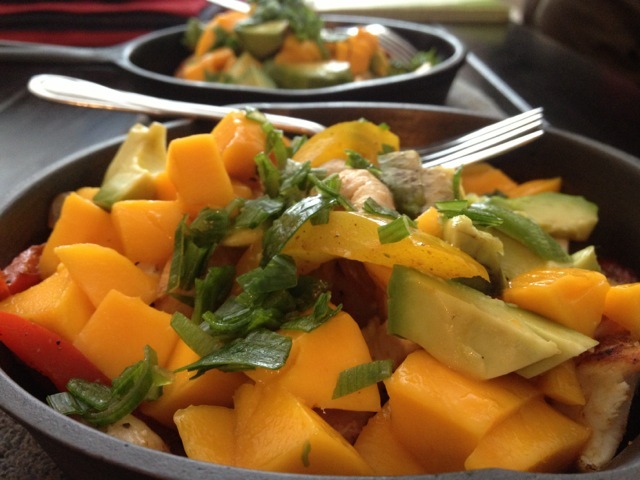 Take out the cookware using heat resistant gloves or a heating pad. Apply oil or shortening with a paper towel to the cast iron to coat it entirely. Then get a fresh paper towel and wipe off the excess oil. Then do it again. Yes, wipe off all the oil or shortening that you can. Yes, I am serious. Put the cast iron back in the oven and increase the heat to 350F. Allow the cast iron to sit for 60 minutes. Apply the oil or shortening again using the same method as before. After the 60 minutes has passed, raise the temp up to 500-550F. Wait for 60 more minutes and then turn off the oven. It will take a few hours for the cast iron to cool and this is good. We would like for the hot iron to cool down slowly in this case. After this process is complete, you will have minimal protection for you cast iron and it will do the job for now. Your job will be to use this cookware. Cook your breakfast on there. Use it for dinner too. Use grease, oil, or fat on there too. Then do it again the next day and the one after that. I think what I am trying to say is USE THE CAST IRON. This will only improve the seasoning and the non stick qualities of the cast iron. “I thought you were not supposed to use soap on cast iron! 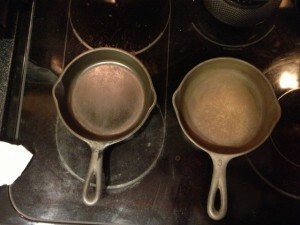 ?” That is definitely a good rule to follow but when you are laying a new foundation of seasoning, it is advisable to go ahead and strip off the old oil and start new. Aside from this process, I have been able to refrain from using soap on cast iron. I just haven’t seen the need so sure follow this rule outside of seasoning cast iron. “My Meemaw said to only use bacon grease to season cast iron.” That’s fine, use any kind of grease, fat, or oil that you prefer. Later we’ll explore using other fats like olive oil, flax seed oil, canola oil, crisco, bacon fat, etc… The point here is to coat the metal with something that repels water, something that is food grade, and something that you have on hand. It might be a little wasteful to use some first press California olive oil but it will still work just fine. 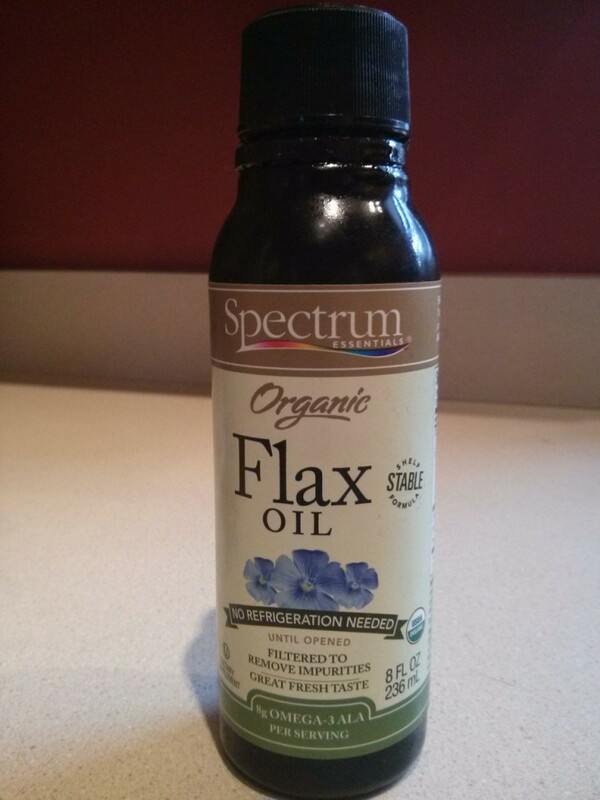 I am very interested in seeing how flaxseed oil works for the initial seasoning. “I want a nice, thick, smooth, black coating of seasoning on my cast iron so why would I apply a super thin layer of grease and wipe it off! ?” Great question. If you put the oil or fat on thickly, then you’ll end up with a sticky, black mess of carbon-y grease. Don’t ask me how I know that! So the key aspect is to just be patient and put on a thin layer of your fat of choice. Your patience will be rewarded…and you impatience will be punished. 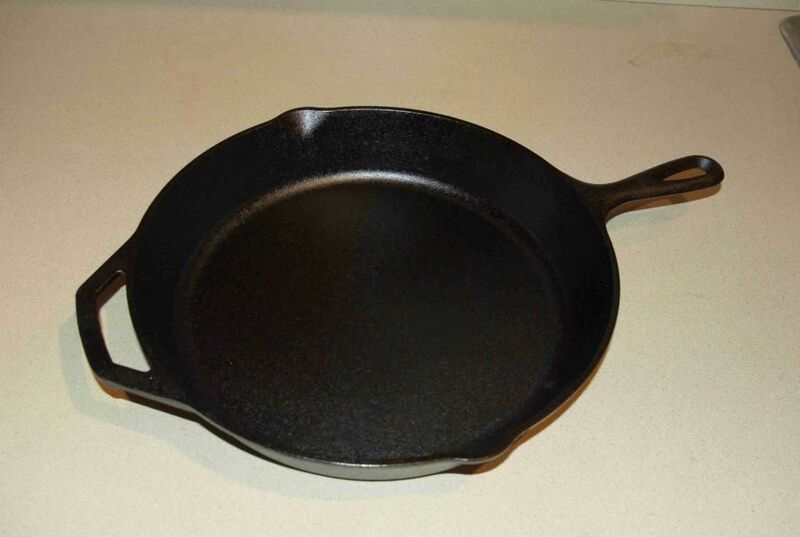 “I followed your instructions and my cast iron looks gray not black. My Pop Pop’s cast iron was literally as black as a cat on halloween night.” Fair enough – that’s quite a metaphor and congratulations on using “literally” properly. If you want your cast iron darker, then you can follow the directions above but just skip the washing part. You will be able to add layer after layer of seasoning. It will get dark, very dark, and a little darker each time with slightly diminishing returns. You can keep on repeating, reheating, oiling, wiping, and cooling, again and again. 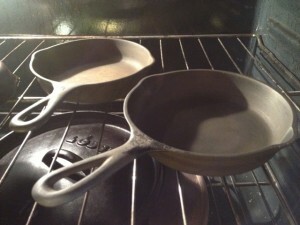 “My brand new Lodge Cast Iron <fill-in-your-cookware> is preseasoned from the factory in S. Pittsburg, TN. Do I need to re-season my Lodge?” Probably not but maybe. It’ll do the job and if you do use your cast iron frequently and keep it clean and lightly oiled, then you will get the nice, slick seasoning you desire. It will take some time but it will happen. 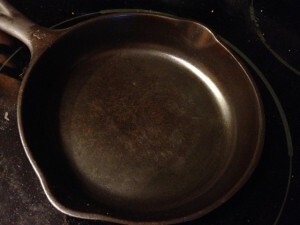 “My brand new Lodge Cast Iron <fill-in-your-cookware> is seasoned but it’s very rough and things stick! What is going on?” Modern cast iron is pretty much all like this. The older cast iron cookware used to undergo an additional step where it was sanded, essentially polished down. I did not realize how significant this was until I got my first WagnerWare Cast Iron Skillet, a 1056N. It was like comparing gravel to freshly waxed car – well, maybe not that dramatic but it was significant. 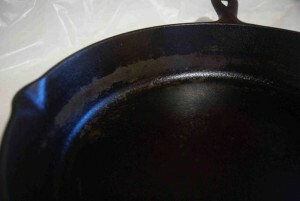 A future article will focus on improving the surface of a modern Lodge Cast Iron piece. Do you disagree with these methods? Do you have a better way? Let me know how you season your cast iron. Comment below to let me know if you have any questions or comments.